I'm taking a course on the Theology of Paul Tillich with Dr. Mark Lewis Tayor this semester, and I am feeling a sense of accomplishment. 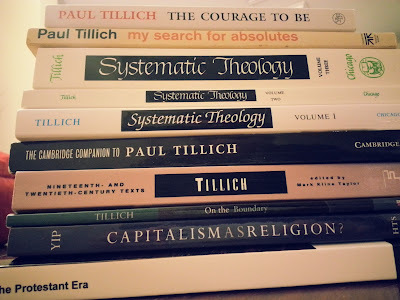 I just finished reading the third volume of Tillich's Systematic Theology. Now that I've become familiar with Tillich's theology, including his system, I can safely say that he's become an important conversation partner for me in my own theological reflection. It's not that I can now think of myself as "Tillichian" per se... in fact I am sure that my own approach has distinct and contrasting differences from that of Tillich. But Tillich is a voice to which I'll have to answer whenever I begin to make an argument for anything that sounds "supernatualistic" or classically theistic. Whenever I begin to articulate a theism which places God in some other location or outside the conditions of human life, I'll have to face Paul Tillich and all the ways in which he has complicated that kind of language. Overall, I can say that I am inspired by Tillich. His theology gives me hope as he enables his reader to push out in different directions. If you've never been exposed to his theology, lemme recommend his little book, On The Boundary... and if you're in for a real treat with just a few more pages, The Courage To Be. His is an important voice which deserves attention. "The sacred does not lie beside the secular, but it is its depth. The sacred is the creative ground and at the same time a critical judgement of the secular. But the religious can be this only if it is at the same time a judgement on itself, a judgement from which it must use the secular as a tool of its own religious self-criticism" -Tillich (in Mark Taylor's Theologian of the Boundaries, 314).